On 25 October SMART-1 fired, for the last time, the electric propulsion engine. This small correction manoeuvre of about 4 hours was necessary to correct the slight over-performance of the engine during the last long burn of 100 hours (10-14 October) during the 'third resonance". From now on the spacecraft will proceed unpowered in its journey towards the Moon - where it will arrive on 15 November. In the meantime, SMART-1 will perform another two revolutions around the Earth. The last time SMART-1 will approach the Earth, the last perigee, will be on 2 November at 07:28 UTC and finally the last part of the Earth orbit will lead to the capture by the Moon and the first perilune on 15 November at 17:56 UTC. Up to 26 October, and the 289th engine pulse, the SMART-1 electric propulsion system has cumulated a total ON time of nearly 3648 hr, consumed about 58.8 kg of Xenon and imparted to the spacecraft a velocity increment of about 2737 ms-1. The electric propulsion firing will be resumed only in lunar orbit on 15 November at 05:28 UTC for a 4.5 days long burn, to reduce the lunar orbit. 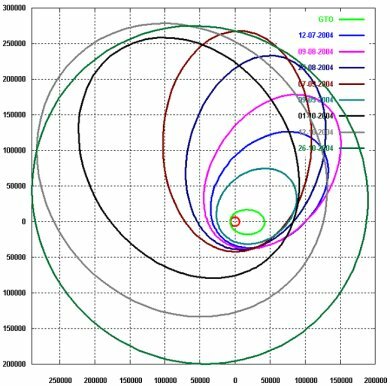 In this diagram the osculating orbits at launch (GTO) and at different times are plotted. It can be seen now the huge effect of the combination of the operations of the electric propulsion together with the last Moon encounter have on the orbit expansion. The moon effects is now mainly in the increase of the perigee altitude, in the rotation of the line of apsides (change in argument of perigee) and in the orbital inclination. Also note the change in the orbit inclination, which has now reached 20°. As explained in the last report, it was mainly the task of the last resonance to shift the orbit plane of the spacecraft towards the the lunar orbit plane, which is inclined at 28° with respect to the Earth equator (it varies between 28°35' and 18°21' with a period of 18.6 years).